Baseball is one of those sports where you can attend a game and either see an exciting battle with a high score or a pitchers battle where the action is quite minimal. This translates pretty well into theater. There are some plays with the fast-paced action while others drag on and on until the big finish. In Randomly Specific Theatre’s production of Larry Phillips’ Secondary Pitch, a slow paced family drama centering around three brothers, one of whom is a legendary baseball pro, as they attempt to reconnect with the potential of a reality show looming. When superstar pitcher Stephen Dowd is forced to retire from the National Pastime, he moves in with his brothers, a down and out minor leaguer and a former reality star, as the trio learn that they may be the source of a new reality show focusing on the behind-the-scenes drama in Stephen’s life. Secondary Pitch is a family drama at its core. As the show’s producer drills in everyone’s head, the dynamics between the brothers is what is most appealing. Where Phillips’ script works is through seeing the rise and fall of three very different personalities. Where the script needs sever help is through the plot and tracking the ever-changing personality shifts from scene to scene. For example, in the first scene of the play we see Stephen as a pretty stand-up guy. Moments later, without warning, he becomes an incoherent drunk. We later learn that he is dealing with addiction, but the initial shift is so drastic, they don’t feel like cohesive ideas. The other problem within the script comes at the outlandish ending. There are a lot of pointing fingers throughout the play with occasional reveals. But in the final moments, there are so many reveals that the action prior is put into question. When we learn that the entire scheme is set up by reality show junkie Kevin, you can’t help but chuckle at the hilarity of the moment. When you think the brothers have finally bonded and the sentimentality of a patched up family is achieved, it’s immediately broken by a “Candid Camera” ambush. And thus, Secondary Pitch plays out like a quintessential reality show. Which is funny, since reality TV is the source of so much of the brother’s drama. But maybe that was the point to comment so strongly on the source. The quartet of actors offered a spectrum of performances. Despite working with hard material, Ryan Dusek as Stephen offered the strongest performance. Though he looked much younger than his proposed age, Dusek played the no-care burnt out pitcher with ease. Peter Buck Dettmann’s baffoonary as Kevin was played up by sight gag clothing. It’s unfortunate his character’s big reveal made him a despicable character. Phoebe Leonard’s even more despicable Meredith was defined by her stop at nothing attack on a family. You couldn’t help but become intrigued by her ruthless journey of destruction but root for her? There was no way to do so. Larry Phillips, who wrote the play, also played Paul, something that did not benefit the production. Phillips character was severely more dramatic, but his portrayal was quite comical. His scenes with Leonard were some of the better moments for his characters, until she drops the truth bomb on him. Director Matthew J. Nichols discovered the truths and sincerity of Phillip's play and brought them to light. With a three quarter thrust set up, staging could be hard, but Nichols was able to allow each seat to be a good seat. Nichols and his design team were able to establish a multi-location world within the small theater. Scenic designer Jason Bolen’s bright green house may not have been the prettiest but the floor treatment greatly made up for it. For those paying close attention, a baseball diamond was designed onto the floor. Was it part of the world of the play or actually in the boys apartment may be up to the audience to decide. Mark Hankla’s lights went to the extremes depending on the location, though the night time scenes were a bit dark. Director Nichols served as sound designer as well, utilizing the baseball idea to the extreme. 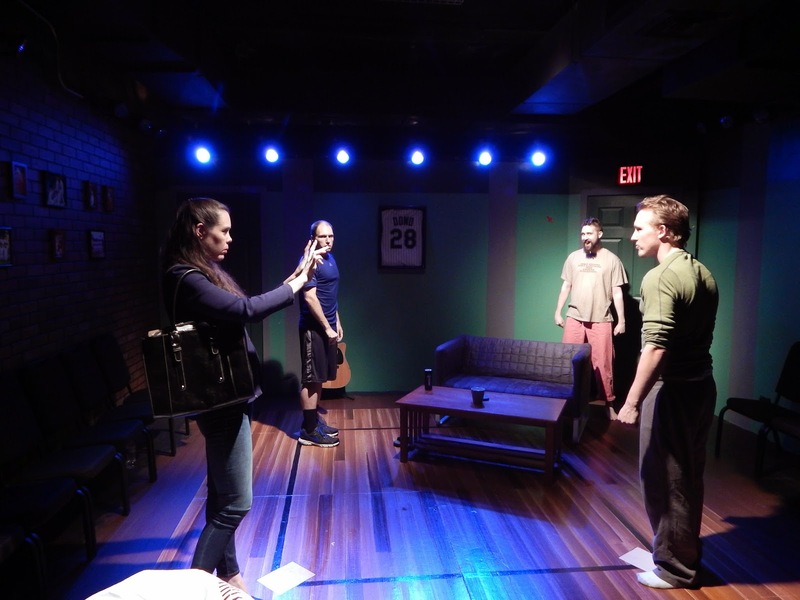 The amount of on point baseball references, from the script to the stage to the sound, were borderline overboard if the message of the piece is that the drama goes beyond the field. Though thematically, discovering that many perfect transition songs should be commended. Secondary Pitch could have been a strong first pitch but with a mediocre cast, the potential of the script was unable to shine through. The play is pertinent and engaging, but to put it in baseball terms, it was barely made contact.